[/media-credit] Sophomore cross country runner Brett Slayton. Brett Slayton started running cross country as a Raider on the inaugural team in 2014, and missed out on a chance to help coach his high school team that year, as a result. He has stuck with it, and became an influential veteran, seasoned to the trade to the rest of his teammates. The Grand Rapids Community College sophomore distance runner has high hopes for this season as he ended last year phenomenally, beating his personal record at the end of the season. 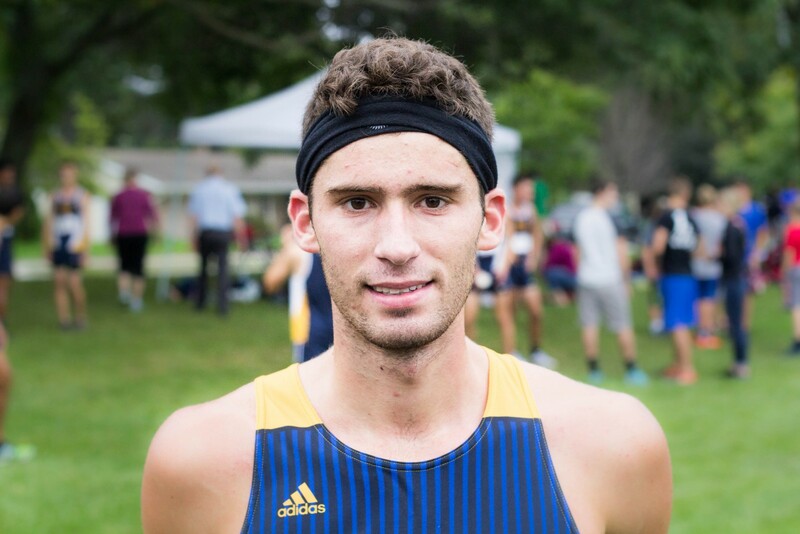 “Brett will undoubtedly be in the top five of the men’s team this fall,” said GRCC Head Cross Country Coach Matthew Sicilia. Each race that Brett and the Raiders run is an 8K (4.97 miles). Slayton’s personal record is 27:04 in the start of the 2016 season. In 2015, he beat his PR by two minutes and 56 seconds. Now, in the 2016 season, he hopes to run steadily in the 26 minute mark. “As a team, we want to go to Nationals. I think that’s a meet on the schedule.” Slayton said. Life doesn’t revolve around Raider Cross Country for Brett, though. Brett is attending GRCC studying psychology, as well as working at his personal trainer’s certification. And when he’s not in school, Slayton works as a part-time fitness desk operator at MVP Sports in Holland. Michigan State Athletics play an important role in the Slayton household, too. “One of the first things you figure out about Brett is that he’s a die-hard MSU fan,” Sicilica said. Slayton and his dad make their way to East Lansing as often as possible to catch both basketball and football games. He enjoys golfing, playing basketball, and hanging with friends in the free time he gets. Brett ran in the 2016 25k Fifth Third Riverbank Run for the first time this spring in Grand Rapids. His time was 1:31:32, with a 5:53 pace per mile. Slayton logs hundreds of miles in the off-season, to prepare for dominance in the fall months. And as an academic all conference runner, Slayton has an important role of showing his teammates how to successfully balance school and cross.